LIVELAKE LAS VEGAS Where you live should be a reflection of how you live. The community, nearby surroundings, and culture that make up your living environment need to reflect the lifestyle you desire, not just the price of your home. At Synergy Sothebyâ&#x20AC;&#x2122;s International Realty, our ultimate goal for each and every one of our Clients is to find the place that makes you feel alive, and inspires you. A True Gem & Like-New 1-Story in Sunrise Villa! Single-story townhome, gated community of Sunrise Villa is like new throughout. Gated courtyard with custom brick planters, walls & shelf. Beautifully appointed with ceramic tile throughout. Corian kitchen counters & all appliances are included. 1700 SF, spacious 3 BRs, large family room with floor to ceiling brick fireplace. Custom 2-tone paint, new A/C, new roof, renovated atrium, patio with hedge for privacy. $275,000. Tastefully Renovated Green Valley Gem! Bill Berning, GRI, CRS, C.P.R.E.S., REALTOR® Call me to assist you with my knowledge and experience in helping all people achieve their dream of home ownership. Entirely new throughout, gorgeous, tastefully executed renovation. Freshly painted interior & exterior. Open, large kitchen with new cabinetry, countertops, farm sink, stainless steel appliances. Spacious living room, new flooring throughout. Easy care front & back yards. Terrific Green Valley location, with great airport access, freeway, shopping & restaurants. This one will not last at $299,500. Large covered parking behind rolling gate, this 3 BR, 2 BA home has too many extra features to list here. Spacious floorplan with tile floors throughout. Master bedroom down with large custom bathroom with tumbled marble floors, walls & countertops. Evap cooled garage with work benches & a separate additional workshop. Call for a complete list of extras! Priced to sell at $314,900. 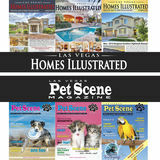 Find your house with your mouse at www.vegasrealestateagent.com Please Say You Saw It in HOMES ILLUSTRATED! GIBRALTAR REAL ESTATE GROUP, LLC. LAS VEGAS IMMOBILIEN GMBH, LLC. BROKER, MARK BACHICK LAKE LAS VEGAS @ TRAMONTO – $340,000 Beautiful, Luxury 3 BR, 2 BA, 2012 SF 1st Floor Villa in Gated Tramonto Subdivision with 2-Car Garage. This Condo has a Private Entrance and an Open Floorplan with High Ceilings, Plantation Shutters and All Upgrades. Quality KitchenAid Appliances, Master Bedroom Opens to Private Patio or to the Huge Entertainment Patio with Misters. Absolutely the Most Private Condo in Tramonto. Only Yards Qway from #3 Green at Reflection Bay, You’ll Feel Total Seclusion Here! SITUATED IN THE HEART OF LAS VEGAS – $199,950 Elegance & Style awaits you in this top floor one bedroom condo! Situated in the heart of Las Vegas secluded in this 16 acre Guard Gated Resort Style Oasis! Enjoy 2 pools, tennis, fitness & business center. Don’t forget the views and convenience! Just blocks away from the Strip and fabulous dining! Just 2 miles from the Convention Center and T-Mobile Arena! This top floor unit comes completely refurbished! DESERT SHORES – CORPORATE RENTAL, 1-3 MONTHS – $4500/MO. Fully furnished 3 BR, 2.5 BA, 2-car garage, 2206 SF home located on a corner lot. Contemporary Corporate Rental – new designer wood-look tile flooring, two-toned paint, new baseboard, new carpet and pad, custom white shaker cabinets with marble counters in kitchen, custom cabinets with high end quartz counters in all baths, custom master bathroom with stone shower, new lighting and plumbing fixtures. Back yard with pool/spa that has new plaster, and cool deck and privacy. All utilities included. lhr Deutscher Immobilienkaufmann, Notar & Dienstleister in Las Vegas ..
20 Finished Lots. All utilities on site. Please Say You Saw It In HOMES ILLUSTRATED! PRICED TO SELL! CALL NOW BEFORE IT’S GONE! Beautiful 2-story condo, good location - just a few steps away from community pool/spa & clubhouse, exercise room. 2 Beds/2 Baths, 2-car garage option. Open floor plan, kitchen overlooks dining & living room. Neutral carpet, two-tone paint, large living room, breakfast bar, dining nook, sliding door to large balcony. All appliances, blinds throughout, water loop for softener. Security front screen door. Immaculate gated community. MLS #2082249. I Have Been A Loan Officer For Over 20 Years and Have Helped Everyone From “First Time Buyers” to “Experienced Investors”. Let me help you find the perfect loan for your financial future. http://www.mortgagehouse.loan/ Please Say You Saw It In HOMES ILLUSTRATED! Ask About Our Buyer Rebate Program! Every Agent Will PROMISE to Sell Your Home… Gean GUARANTEES IT! TRUE PRIDE OF OWNERSHIP HERE! Hurry! This Gorgeous SW Home with Stunning Contemporary Architecture is an Absolute Show Stopper! Property is Completely Upgraded Inside & Out and Truly Does Have Too Many Incredible Features to Mention. Huge 65’x28’ RV/Toy Garage with Complete Hookups & 14’x14’ Door – Must See! Resort-Style Backyard has a Beautiful Pool & Detached Casita with Full Bathroom. All of this is Powered by the Owned Solar System! Very Easy to Show! Be Ready to Call This Home YOURS! Contact Gean B. Haffey IV at 310-503-0600 for Showings and Additional Information Please Say You Saw It In HOMES ILLUSTRATED! LOOKING TO SELL, BUT DON’T KNOW WHO TO LIST YOUR HOME WITH? Read Below & You’ll See Why Our Sellers Chose Elizabeth to Sell Their Home. Fantastic 3 BR, 2 BA home with an open floorplan, 3-car garage + RV parking with hook up. Move-in ready 3 BR + loft, 2-story with 2-car garage & open island kitchen with appliances included! Full Service MLS • No Hidden Fees. Never Sign a Long Term Contract. More money in your pocket than Open Door, Redﬁn & Purple Bricks. I will pay for your appraisal!! Let My Team Work For You To Buy/Sell in Las Vegas! www.GoodmanGroupLV.com Please Say You Saw It in HOMES ILLUSTRATED! HOME LOAN? WE HAVE THE LOANS YOU NEED! I WORK FOR YOU! CALL OR TEXT 702.524.1376 TODAY! ✓ 5% DOWN to $1,500,000! Good credit required. ✓ 10% DOWN to $2,000,000! ✓ “DOCTOR LOANS” as little as 3% DOWN! ✓ 15% to 20% DOWN to $2,000,000! I Would Love To Work With You, Call Me Today! North American Financial Corporation located at 375 Stephanie Street, Building 18, Henderson, NV 89014, NMLS #180736; Alaska Mortgage Broker Lender License #AK180736; Arizona Mortgage Banker License #0928446; California – Licensed by the Department of Business Oversight under the CA Residential Mortgage Lending Act. – DBO Residential Mortgage Lending Act License 6031452; Colorado Mortgage Company Registration; Nevada Mortgage Broker License #1429; Texas-SML Mortgage Banker Registration; Washington Consumer Loan Company License CL-180736. North American Financial Corporation is an Equal Housing Lender, this is not an offer for extension of credit or a commitment to lend. Spacious 3 BRs, almost 1900 SF newer townhome. Attached 2-car garage. Great room opens to fabulous kitchen with granite counters/backsplash, island, walk-in pantry and upgraded cabinets. Wood floors. Downstairs bedroom & bath. Large loft upstairs. Master has 2 walk-in organized closets & amazing bath with spa-like shower and double sinks. Laundry room with cabinets. Lovely landscaped yard, covered patio and park area behind. A MUST SEE!! www.JanaShore.com Please Say You Saw It in HOMES ILLUSTRATED! • 2 Bedrooms • 2 Baths • 1038 Sq. Ft.
• 4 Bedrooms • 3 Baths • 1827 Sq. Ft.
• 3 Bedrooms • 2 Baths • 1180 Sq. Ft.
• 4 Bedrooms • 3 Baths • 3608 Sq. Ft.
• 4 Bedrooms • 3 Baths • 2072 Sq. Ft.
• 2 Bedrooms • 2 Baths • 1086 Sq. Ft.
• 2 Bedrooms • 2 Baths • 931 Sq. Ft.
• 3 Bedrooms • 3 Baths • 1468 Sq. Ft.
• 2 Bedrooms • 2 Baths • 1780 Sq. Ft.
• 4 Bedrooms • 2 Baths • 1234 Sq. Ft.
• 3 Bedrooms • 3 Baths • 2496 Sq. Ft.
• 3 Bedrooms • 2 Baths • 1687 Sq. Ft.
Office independently owned and operated. Advertised homes are not necessarily the brokers listing. • 4 Bedrooms • 4 Baths • 2897 Sq. Ft.
• 2 Bedrooms • 2 Baths • 1384 Sq. Ft.
• 4 Bedrooms • 3 Baths • 1916 Sq. Ft.
• 2 Bedrooms • 2 Baths • 1503 Sq. Ft.
• 4 Bedrooms • 3 Baths • 2986 Sq. Ft.
• 3 Bedrooms • 2 Baths • 2510 Sq. Ft.
• 5 Bedrooms • 3 Baths • 2537 Sq. Ft.
• 4 Bedrooms • 4 Baths • 2522 Sq. Ft.
• 2 Bedrooms • 2 Baths • 2181 Sq. Ft.
• 3 Bedrooms • 3 Baths • 1922 Sq. Ft.
• 3 Bedrooms • 3 Baths • 3266 Sq. Ft.
100% FINANCING – ZERO DOWN! CONVENTIONAL LOANS UP TO $475K! PRE-APPROVALS ISSUED IN MINUTES! CALL TODAY! *Certain restrictions apply. GORGEOUS 2-story! Upgrades throughout this 3 BR, 2.5 BA, almost 2200 SF home. Den with built-in wood shelves & real wood floors. SS appliances & convection oven. Backyard oasis with synthetic grass, putting green & retractable patio cover! Priced at $399,999. MR. CLEAN LIVES HERE! Great 3 BR home with over 1800 SF. Amazing layout with bright, open island kitchen. Plantation shutters, new carpet upstairs and tile downstairs, freshly painted. Spacious bedrooms with upstairs loft! Cul-de-sac! Priced at $304,999. FULLY RENOVATED! Chef’s dream kitchen with custom cabinets, stainless steel appliances and granite counters! Upgraded bathroom with walk-in shower. Rolladen shutters throughout plus much, much more! Gated community. Don’t miss out! Priced at $120,000. GREAT STARTER HOME! Adorable 2 BR + loft, 1100+ SF 2-story home with a lot of potential. Great open layout. Upstairs loft/game room with balcony. Walk-in closet in master suite & so much more! Don’t miss out, call now. Short Sale, call for price. Immaculate 2 BR, 2 BA home with dual masters in the Northwest! Very spacious living area with huge kitchen! Upgrades galore! Just listed... call today for more information! Reduced! Priced at $179,999. 2800 SF home in a cul-de-sac with no HOA! This gorgeous home offers shutters, renovated master bath, wet bar, brick fireplace, tile floors throughout. Large master & secondary bedrooms. 5515 Rondonia Circle. Priced at $395,000. INVESTOR SPECIAL! Fully furnished 2 BR, 2 BA, almost 1000 SF condo in Decatur Villas. Built in 1998. Renovated throughout! Close to freeway, shopping & schools. This is a great investment opportunity, don’t miss out! Priced at $104,999. Green valley beauty! Great 2 BR, 2.5 BA, 1100+ SF townhome with attached garage. All appliances stay! Great layout with 2 master suites upstairs! Covered patio & so much more! Closet o Green Valley Ranch & The District. Short sale. Just listed! Priced at $219,999. FORMER MODEL HOME! Former model home in the beautiful Glenbrook Estates! UPGRADES GALORE! 5 BRs, 3 full BAs, 3000+ SF with 3-car garage on over 1/4 acre lot. Call for details & current price. DON’T GAMBLE WITH YOUR REAL ESTATE NEEDS great opportunity in the NW! 4 BR, 2.5 BA home with over almost 1900 SF. The large kitchen has granite counters, breakfast bar, island and refrigerator included. Nice size master bedroom includes a balcony. Covered patio in backyard with desert landscaping. Easy access to most anywhere with the 215 and 95 close by along with shopping. Call for pricing. Two bedroom condo where the master has a huge walk-in closet. Kitchen has upgraded cabinets, granite counters and tile floors. Spacious living room with fireplace. Freshly painted and carpets cleaned, so ready to move right in. Community with 2 swimming pools, nice clubhouse with workout/gym room. Call for updated price. DOWNSTAIRS CONDO PRICED TO SELL! gated townhome near lv strip! This 2 BR, almost 900 downstairs condo is perfectly located for getting down to the Strip, up to Summerlin, to the airport or the 215 to reach anywhere in the valley. Nice size living & dining area. The galley kitchen is perfect for preparing all your meals with plenty of counter and cabinet space. The community features tree lined streets, a pool & spa and is gated. Call for price. Wonderful 2 BR, 2.5 BA townhome with 2-car garage. New flooring and paint throughout. The home features dual masters each with their own bathroom and walk-in closet. Located near the Las Vegas Strip and the airport. The community is gated with lots of green area, a clubhouse, pool and newly redone tennis, pickleball & basketball court. Call for pricing. GORGEOUS AMERICA WEST 2-STORY HOME WITH $20K IN UPGRADES! • 4 BRs + Loft, 3.5 BAs, 2900+ SF • Java Oak Laminate & Porcelain Wood-Like Tile • Nice Size Corner Lot with Backyard that Awaits Your Dreams! • Stainless Steel Appliances & Huge Island • Don’t Miss Out On This Beauty! BEAUTIFUL & UPGRADED 2-STORY IN MOUNTAIN’S EDGE! • 3 BRs + Loft, 2.5 BAs, 1700 SF • Ceiling Fans in Family Room & Loft • Island Kitchen with Granite, Espresso Cabinets, Walk-In Pantry, Breakfast Bar & More! • All Appliances Including Washer & Dryer • Solar Panels = Lower Electric Bills ! SEMI-CUSTOM DR HORTON WITH TROPICAL RESORT POOL/SPA! Upgraded Open Floor Plan with 2 Master Suites, Custom Slate Flooring, Double Convection Ovens, Six Person Breakfast Bar & Walk-In Pantry, Black Galaxy Granite Counters, Professional SS Jenn Air Appliances & Custom Alder Cabinets. Secluded 0.23 Acre Lot that Backs to Sloan Preserve with Extended Covered Patio, Surround Sound & Fireplace. $739,900. ULTRA MODERN 4 BEDROOM IN HENDERSON WITH MOUNTAIN VIEWS! Semi-Custom with Exterior Stone Elevation & Elastomeric Paint. Atrium with Guest Casita. Chefs Island Kitchen, Zodiac Quartz Counters, Merlot Maple Cabinets, GE Monogram SS Appliances & Convection Oven. Large Master with Fireplace & Balcony. Private Rear Yard, Professional Landscape with Pavers & Covered Patio. $629,900. HE N IN DER CA SO LIC N O R VIE IDG WS E! ANTHEM COVENTRY 5 BR + LOFT, 4 BA WITH DOUBLE MASTER SUITES. Property Rebuilt Top to Bottom with Designer Flooring, Upgraded White Kitchen with Breakfast Bar Island, Granite Countertops Throughout. Milgard Tuscany Sliding & French Doors at Family Room & Kitchen. Large Private Backyard with Lush Landscaping. $614,900. RECENTLY RENOVATED WITH WATERFALL POOL/SPA. Wood-Style Ceramic Tile & Designer Lighting Décor. White Kitchen with Granite Counters & SS Appliances. Master with Sitting Area & 2-Way Fireplace. Spa-Style Bath with Glass Shower, Body Jets & Claw Foot Tub. Huge Private 1/3 Acre Lot with Firepit & Cascading Pool/Spa. $499,900. 2M G AS AT TE ED RB W ED ITH RO OM S! BEAUTIFUL FIRST FLOOR RESORT CONDO! Spacious 2 BR with Neutral Tile Floors Throughout. Gas Fireplace in Living Room. Sunny Kitchen Nook with Breakfast Bar & Pantry. Master with Walk-In Closet & En Suite Bath. Private Covered Patio & Separate Covered Parking Space. Gated Community with Pool & Exercise Room. $159,900. SPACIOUS 3 BR WITH LOFT IN MCCULLOUGH HILLS OF HENDERSON. Large Living Room with Fireplace & High Ceilings. Island Kitchen with Stainless Steel Appliances & Eat-In Breakfast Nook. 2 Master Bedrooms. Private Bedroom & 3/4 Bath Downstairs. Separate Laundry Room. Nearby Green Valley Ranch, Arroyo Sports Complex & 2 Parks. $325,000. GREAT LOCATION WITH 3 FULL BEDS, 2-CAR GARAGE AND WHITE & GREY DESIGNER CONCEPT UPGRADES! Like New & Stunning White Designer Kitchen. Master Planned Community with Pools & Parks. Wood Plank Style Tile Floors, Flat Panel Cabinets, Granite Counters & SS Appliances. Open Loft with Roomy Master Suite. Secluded Paved Porch with Gate to Enjoy the Outdoors. $329,900. ADORABLE GATED STONE LAKE COVE. 3 BR + Loft. Chef’s Kitchen with Custom Hood, Granite, Double Ovens. Large Master Suite & En Suite Bath with Quartz Surrounds. Private Lot with Pro Landscape. Backs to Cornerstone Park & Pond with Grass Area, Jogging/Walking Path. $349,900. OUR SELLERS GET TOP DOLLAR & SAVE MONEY WITH OUR FLEX COMMISSION PLAN Please Say You Saw It In HOMES ILLUSTRATED! #1 rated odor elimination vendor! TOBACCO? MARIJUANA? COOKING? PET? MUSTY ODORS? Protect your value of your home. Master Odor Removal’s systems work to eliminate odors in apartments/rentals and homes by reversing the way interiors become malodorous. Proven and guaranteed! Our client’s peace of mind and restoration of a property’s smell impression and resale value is of the utmost importance as we service your needs on-call. It’s Gone – Guaranteed! Commissions are not set by law. All commissions are negotiable. There are no standard commission rates. Each seller decides total commissions paid. Call for full details. LAS VEGAS ✯ 1218 SQ. FT.
LAS VEGAS ✯ 1035–3653 SQ. FT.
LAS VEGAS ✯ 1593 SQ. FT.
LAS VEGAS ✯ 2943 SQ. FT.
NW LAS VEGAS ✯ 1851 SQ. FT.
LAS VEGAS ✯ 520 SQ. FT.
LAS VEGAS ✯ 1430 SQ. FT.
LAS VEGAS ✯ 1895 SQ. FT.
N. LAS VEGAS ✯ 2042 SQ. FT.
LAS VEGAS ✯ 533 SQ. FT.
LAS VEGAS ✯ 2173 SQ. FT.
LAS VEGAS ✯ 659 SQ. FT.
$0 DOWN FHA Program with a 620 FICO LEADERONE NOW OFFERS – 100% Financing on FHA home loans. FEATURES – Low Interest Rates, No Repayment on 2nd DOT* (if you make less than $73,000*) *No Repayment on 2nd DOT through Chenoa Down Payment Assistance Program. ** Max FHA Loan Amount $294,515. Call for details. Apply online or call me. LeaderOne Financial Corporation is licensed by the Nevada Mortgage Lending Division – Mortgage Broker License #4186. Corporate Headquarters: 7500 College Blvd., Suite 1150; Overland Park, KS 66210, NMLS ID #12007. http://www.nmlsconsumeraccess.org. Toll Free (800) 270-3416. This advertisement does not constitute a loan approval or a loan commitment. Loan approval and/or loan commitment is subject to ﬁnal underwriting review and approval. $229,990 Only 8 Homes Left! Hurry, This Community Won’t Last Long! 1589 SF up to 3059 SF. 3 – 4 Beds, up to 2300 SF. 3 Bed, 2.5 Bath, 1657 SF. 2 – 5 Bed, 1500 SF – 2055 SF. 4 Bed, 3 Bath, 2327 – 2727 SF. 5 Bed, 3 Bath, 2565 SF with Pool & Spa. SELLING YOUR HOME? Don’t lose all your equity on paying REALTOR® commission. Our New Home Purchase Program puts the money back in your pocket! Ask us how it works. *All monthly payments are principal & interest only. Rates & payments are based on FHA 30 year fixed 3.5% down, 3.9% interest rate, APR 4.096%. Other closing fees & costs apply. Rates & fees on approved credit & are subject to change, without notice until locked. Incentives, grant programs and home prices are subject to cancellation or change without notice. The advertised Toll Brothers home is shown with a 20% down payment.Call for details. 3 Bed, 2.5 Bath, 1851 SF. 3 Bed, 2.5 Bath, 2085 SF, 3-Car Garage. 3 – 6 Bed, 1731 – 3231 SF. 3 – 4 Bed, 2.5 Bath, 1735 SF – 2035 SF. 3 Bed, 2 Bath, 1369 SF. • We get you additional incentives – not available without our free service. • Get up to $20,000 toward your down payment & closing costs! Ask us how! *All monthly payments are principal & interest only. Rates & payments are based on FHA 30 year fixed 3.5% down, 3.9% interest rate, APR 4.096%. Other closing fees & costs apply. Rates & fees on approved credit & are subject to change, without notice until locked. Incentives, grant programs and home prices are subject to cancellation or change without notice. The advertised Toll Brothers home is shown with a 20% down payment. Call for details. Whether you’re looking to buy or sell your home, I CAN HELP! Call for a Free Market Evaluation of Your Home and/or a Free Buyer Consultation. Call (702) 496-2830 Today! BEAUTIFUL & SPACIOUS! 5 BR (1 down), 3 BA, 3-car garage with pool & spa in Mountain’s Edge. Granite counters with island, custom cabinets, SS appliances, pantry, pendant lighting & mosaic backsplash. Family room with stone fireplace. 2-tone paint & crown molding. Porcelain tile down, carpet up. Master with walk-in closet, separate tub & shower with mosaic tile. 2 large lofts. All BRs have ceiling fans. Ceramic pool & spa with desert landscaping. CALL ME TODAY AT 702-496-2830 FOR A PRIVATE TOUR! Buying or Selling – Let My 13 Years of Experience Work for You! Hello! I am a Beauty with a Rooftop Deck! Rooftop deck with fireplace comes with this 3 BR, 2.5 BA, 2200+ SF home. Professional yard with jacuzzi. Island granite kitchen, dining area off kitchen, spacious family room, large den, big loft & so much more! Immaculate, move-in ready 3 BR, 2.5 BA, 1700+ SF home with den. Beautiful, large kitchen with overlooks the great room + upgraded flooring throughout! 2 master suites – 1 with walk-in closet. Fully landscaped & more! Super Great Home in Summerlin! Bright & Spacious in Iron Mountain Ranch! Move-in ready 3 BR, 2 BA, 1100+ SF home with fresh paint throughout! Located near Summerlin Hospital, shopping, dining, library the list goes on. All new SS appliances. Living room with gas fireplace & more! 4 BR + loft, 2.5 BA, almost 2100 SF 2-story home. Fabulous island kitchen with lots of cabinets & counter space. Warm & inviting living/dining room, separate family room. Beautiful backyard with covered patio. All appliances! 3-Story Townhome – Shows Like a Model! Phenomenal Townhome with 2-Car Garage! Absolutely stunning 4 BR, 3.5 BA, 2000+ SF townhome. Bright & spacious mid level area with living & dining + den. Gourmet upgraded, kitchen with SS appliances. Master with walk-in closet & more! Great amenities. 3 BR, 2.5 BA, 1400+ SF townhome located in a gated community. Open floorplan with tile & carpet flooring throughout. Spacious kitchen with wood cabinets & all appliances. Huge living room & so much more! Free Buyer Representation • Resale, New Homes, Foreclosures, Short Sales Please Say You Saw It In HOMES ILLUSTRATED! We Beat RedFin by 25% If you’re going to buy a house in the next 12 months, sign up now! “Steve’s commission rebate helped us by a home for our grandson.” Shirley R.
Visit www.robturney.com or Scan my QR Code to view my listings. All the Luxury, None of the Pretentiousness! Gorgeous Custom Summerlin Adjacent – Over 1/2 Acre, No HOA! You’ll immediately fall in love with this amazing custom home that has all the luxury you expect, but retains a softer side with natural wood floors, plantation shutters, red brick exterior finishes and warm family spaces that beckon you to create lasting memories. Sprawling entertainer’s dream backyard with mature landscape and grass, a sparkling pool and spa with waterfall that once you see it, you’ll want to dive right in. Pool/covered patio area is fenced separate from grass/backyard area. Custom iron and frosted glass doors, charming curved staircase of wrought iron and hardwood. Formal living and adjacent dining areas – both with coffered, inlaid ceilings. The highly upgraded eat-in island kitchen will inspire your inner chef to prepare delicious gourmet meals. Family room has high ceilings, brick fireplace to spend cool cozy evenings while being surrounded by windows that overlook the pool and back garden areas. Highly Upgraded Multi-Level Home Literally Has A Family Room On Every Floor! Walk up the cobblestone entry and step into this amazing architectural delight. The structural movement between floors adds to the open airy feeling within this home, harkening to an open loft feel at times. The main floor features a spacious family room complete with coffered ceilings, surround sound and built-in cabinets overlooking the upgraded eat-in island kitchen with SS appliances and more. Beautiful views of Red Rock and the Spring Mountain range. Master suite situated on the ground floor has its own retreat area complete with in ceiling speakers and entry to backyard. 3 secondary BRs and game/movie room + tech loft would be great as a study area, home office and more! Luxury Living On The Strip! breathtaking! Priced at $699,990! Huge 3 BR, 2.5 BA, 2000+ SF high-rise condo with study, 2 balconies, STRIP views towering above the city! Large master with walk-in, 2nd and 3rd BRs with Jack-nJill bath. Open kitchen, dining and living areas. Contemporary finishes. This is the most talked and written about condo high-rise in Las Vegas! Also available for lease, call for details. www.DesiredHomeValue.com Please Say You Saw It in HOMES ILLUSTRATED! Gorgeous 3 Bedroom, 2 Bath, Over 2800 SF Single-Story with Separate Dining, Office & Den – Anything You Need. Spacious Split Floorplan. Kitchen Hidden Around the Corner with Large Island with Seating on Both Sides. Separate Laundry Room with Large Linen Closet. Extra Large Master Suite with Perfect En Suite Bath. Large Covered Patio & More! MacDonald Highlands… Beautiful Home with Great to Detail! Beautiful Home Attention with Great Attention to Detail… Professionally designed with high-end touches. Flowing ﬂoorplan with master suite and ofﬁce downstairs. Formal living and dining rooms with butlers pantry and wine refrigerator. Kitchen with 2 Thermador dishwashers, Viking 6-burner stove, Thermador double ovens & built-in refrigerator. Wood ﬂoors down and upgraded carpet up. Amazing backyard with sparkling pool (solar & gas heated), lush landscape & special pet enclosure off master suite to keep your pets safe. Tandem 3-car garage with storage shelves & so much more! $1,100,000. Call 702-768-4556 for Your Private Tour! Cactus and Jones… Absolutely Beautiful Home with Lovely Views! Freshly painted, clean and inviting, this 3 BR plus den, 3.5 BA home has lots to offer. Main ﬂoor has open concept with big island kitchen that looks into living room area & balcony with mountain views. Bedrooms on top ﬂoor, large master separate from others has bath with double sink and walk-in closet. Lowest level has family room that opens to backyard space. All appliances included. This home shows great and is ready for a fast close! $289,500. Call 702-768-4556 to Tour This Home! We have 20+ years dealing with the New Home Builders. YES, WE ANSWER THE PHONE. Work with an Agent with the Tools & Experience to guide you through the Buying Process whether you are here or out-of-state. Providing Buyer or Seller with Full Communication and Information of the status and all updates during the transaction. We can help you negotiate with the builder, look out for you throughout the transaction and help create a smooth and timely closing. Call, Text or Email Us Direct. We pride ourselves in the fact that we are there for our clients. When you have questions, we are there for you. • Builder Incentives! • You Pick the Location! • NO BIDDING WARS!!! Call Petra Today for More Info! Beautiful 4 BR, 2400+ SF home near shopping & restaurants. Open floorplan with formal living room, family room & dining area. Granite island kitchen. Tile floors downstairs & more! MOVE-IN READY IN HENDERSON! $399,000 Gorgeous 4 BR + loft, almost 2300 SF 2-story with pool & spa. New tile floors in living, family, kitchen, dining & laundry. New paint, new SS stove, microwave, dishwasher & more! I CAN ASSIST YOU WITH BUYING OR SELLING A HOME! Call Petra Today! 702-856-6356 To View These Homes & Others! Spacious 3 BR, almost 1800 SF home with separate living & family rooms. Ceramic tile & carpet flooring throughout. Covered patio. Balcony with views of community parks! Available FREE throughout Southern Nevada • Out of town? ALL MAJOR CREDIT CARDS AND PERSONAL CHECKS, MONEY ORDERS ACCEPTED. E-MAIL: lvhomes@lvcoxmail.com Please Say You Saw It In HOMES ILLUSTRATED! • Summerlin – $3,550/mo. Fully Furnished – 3 BRs, 2.5 BAs, 2-Car. I am a Full Service, Full-Time Property Manager – Call (702) 461-2060 Today! • Properties Listed/Advertised on MLS/REALTOR.com • Lease Preparation: Deposits Collected • Property Maintenance & Repairs Please Say You Saw It In HOMES ILLUSTRATED! 00 ,0 89 5 $ PRICE TO MOVE FAST! 00 ,0 45 1 $ READY TO SHOW & SELL! LAS VEGAS COUNTRY CLUB BEAUTY! 00 ,0 25 1 $ READY TO SHOW & SELL! COZY CONDO IN BELLA VITA! Living area is spacious. Master bedroom includes a huge walk-in closet and charming covered patio! Close to shopping and the airport! Tenant occupied on month to month lease. HUGE 2-STORY IN THE SOUTHWEST! IMMACULATE UNIT IN THE OGDEN! NEW 4 BEDROOM HOME IN HENDERSON! BEAUTIFUL BACKYARD! GREAT 3 BEDROOM HOME! HURRY! PRICED TO RENT FAST! Monthly Management Fee * Please Say You Saw It In HOMES ILLUSTRATED! My years in the business have provided me the experiences, resources, and contacts to assist you with nearly every real estate need. Whether it’s ﬁnding you a home, or helping you get the most out of selling your home, I am here to guide you. 180° VIEW OF THE STRIP, lights & the mountain from the balcony that stretches entire width of the house. This 4 BR, 3800+ SF home boasts 2 masters – 1 down with its own laundry room & 1 up with a coffee bar, access to the balcony, generous closet & beautiful bathroom. Huge bonus room & small secondary loft. Backyard oasis, perfect for entertaining with heated pool & spa! Close to Red Rock Conservatory, Downtown Summerlin & many amenities. PURE LUXURY AWAITS YOU in this 4 BR, almost 3400 SF 1-story Christopher built home. Brazilian hardwood floors, custom light fixtures, formal living & dining, den & family room with fireplace. Attached casita with built in office & bathroom. This gem also features a wet bar & a 300 bottle temperature controlled wine cellar. Spacious master has dual custom closets. You’ll excited to entertain family & friends in the amazing backyard with the pool/spa with descent waterfalls & putting green. BE READY TO FALL IN LOVE with this 4 BR, 2000+ SF former model home with upgrades throughout. Granite counters, 42” uppers in the island kitchen. Dual sinks, separate tub & shower in the master bath. Cultured marble bathroom surrounds, under mount sink in bathrooms, plank style floors, elongated toilets & energy saving features throughout. Low maintenance backyard. Easy access to the 215 & more. Did I mention the huge loft/bonus area? Hurry, priced to sell! Please Say You Saw It In HOMES ILLUSTRATED! 3 BR/2 BA – NORTHWEST HOME WITH RV/BOAT PARKING! 3 BR/2 BA – RENOVATED HOME WITH CUSTOM UPGRADES! Great single-story on corner lot. RV/boat parking. Living room with wood burning fireplace. Large kitchen with nook. Dining area. Spacious master suite with garden tub/shower, make-up vanity & double mirrored closets. Nice sized guest rooms with fans. Storage shed in backyard. Welcome home to this beautiful single-story home. Fully remodeled bathrooms. Open floorplan, fireplace in family room leads to covered patio, putting green, above ground hot tub, desert landscape & private screened porch area with direct pet access into master suite. No carpet. Side gate could accommodate car/boat parking. CONVENIENT LOCATION NEAR TRANSPORTATION, RETAIL & RESTAURANTS! 3 BR+DEN/2.5 BA – VINTAGE VEGAS POOL HOME ON 1/2 ACRE LOT! 3 BR+LOFT/2.5 BA – GATED HENDERSON TOWNHOME WITH 2-CAR GARAGE! Living & family rooms with wood burning fireplaces & wet bar. Formal dining, kitchen with granite, nook, custom cabinets with pull out storage & stainless steel appliances. Backyard oasis complete with 20’x40’ pool, separate spa off the master sliders. Gorgeous townhome in gated community with attached 2-car garage. Community pool & spa. Granite kitchen with breakfast bar & updated cabinetry. All appliances included. Big guest bedrooms. Large loft. Private patio/yard. SPACIOUS SINGLE-STORY WITH GARDEN AREAS & MORE! LARGE MASTER WITH 2 CLOSETS, BALCONY, GARDEN TUB & WALK-IN SHOWER! 2 BR/2 BA – GATED CONDO WITH POOL/SPA! 2 BR+LOFT/2.5 BA – SUMMERLIN HOME NEAR DOWNTOWN SUMMERLIN! Gated community. Sparkling pool & spa. Well maintained unit with laminate floors. Open kitchen with breakfast bar & tons of cabinetry/counter space. All appliances included. Separate master suite with walk-in closet & garden tub/shower. Gorgeous Summerlin home conveniently located near Downtown Summerlin retail & restaurants. Community parks nearby. Gourmet kitchen with granite & updated cabinetry. All appliances included. Living room with vaulted ceilings & fireplace. NICE SIZED GUEST BEDROOM WITH ACCESS TO BATH! NICE SIZED GUEST ROOMS & LOFT, PRIVATE YARD & ATTACHED 2-CAR GARAGE! Call 702-510-8781 Today To Find Out if You Qualify For This FREE Grant! Remodeled 2-Story with Pool & Spa! Beautifully Remodeled 4 BR, 3 BA Home with 3-Car Garage, Custom Kitchen & Bathrooms! Former Model Home in Inspirada! Gorgeous Kitchen with Granite Counters & Breakfast Bar. 3 BR, 2.5 BA, Almost 1600 SF with 2-Car Garage! 1-Story Home with Mountain & City View! Upgraded 3 BR, 3 BA, 2600+ SF Home with Spa & Built-In BBQ! 2-Story Home with Downstairs Bedroom! Almost 3000 SF Home with 4 BRs, 4 BAs, Custom Tile & Shutters! Tri-Level Home with Downstairs Bedroom! Beautiful Home Has Almost 3000 SF with 4 BRs, 3 BAs on a Large Lot with RV Parking! “LAS VEGAS MORTGAGE MAVEN” Please say you saw this ad in Homes Illustrated & I will reimburse your appraisal fee upon a successful close of escrow!!! Visit www.TrishNash.com for more Listings & Photos! 5 BR, 4 BA, 3700+ SF – Remarkable 2-Story with 3-Car Garage in Lake Las Vegas on Premium Lot with Breathtaking Views of Mountains, Golf Course, Pool & Spa! 4 BR, 5 BA, 4500+ SF – Stunning Custom Estate Perched in Calico Ridge. Amazing Floorplan with Built-In Bookcase & Entertainment Center, Stair Lift to 4-Car Garage & Basement! 3 BR, 2.5 BA, 2100+ SF – Luxury Living with Golf Course Views. Courtyard. Great Room with Entertainment Niche & Fireplace. Beautifully Landscaped Backyard with 2 Covered Patios! 3 BR, 3 BA, 2600+ SF – Golf Course Lot with Mountain Views. Guard Gated Community. Chef’s Kitchen with Granite Counters & SS Appliances. Master Suite with Sitting Room! 4 BR, 3 BA, 3200+ SF – 2-Story Home on a Cul-De-Sac Lot, Loaded with Upgrades. Kinetco Water System, Butler’s Pantry with Wine Fridge, Granite Counters & Backyard with Synthetic Grass! 3 BR, 2.5 BA, 2200+ SF – Casita. Living Room with Fireplace, Entertainment Nook & Wet Bar. Granite Counters in Kitchen. Covered Patio, Strip View & More! 3 BR, 2.5 BA, 2400+ SF – Custom Built Home with Beautiful Views. Vaulted Ceilings & Fireplace. Breakfast Nook with Bay Window & SS Appliances in Kitchen! 4 BR, 3.5 BA, 3100 SF – Beautiful Pool Home in the Heart of Green Valley with Vaulted Ceilings, Spacious Island Kitchen, 2 Family Rooms & Fully Landscaped Yards! 4 BR, 2.5 BA, 2600+ SF – Tri-Level Townhome in Vila Di Lago of Lake Las Vegas. Very Open with Vaulted Ceilings & Elevator. Home with City, Golf Course & Lake Views! 4 BR, 3 BA, 2200+ SF – Open Floorplan with Vaulted Ceilings & Gorgeous Flooring Throughout. Large Loft Upstairs. Large Pool Sized Lot with Easy Care Landscape! My 20+ Years Experience Will Help You Navigate Through Selling, Buying or Renting a Home. Call or Click to Speak Myself or One of Our Experienced Experts Today! Getting Your 1st Mortgage Payment Paid Up to $5,000! * *Restrictions Apply, Call for Details. LOOKING FOR BRAND NEW HOMES – CALL (702) 239-2954 TODAY Builder Incentives • Closing Costs Paid • HOA Fees Paid For Up to 1 Year BETTER THAN NEW! Beautiful 3 BR, 2 BA, 2200+ SF 1-story home with an open & spacious floorplan. Custom floors & paint throughout. Breakfast bar in kitchen. Washer & dryer included. Heated pool & spa in the resort-like backyard! ROOF TOP DECK ON THIS BEAUTY! This 3 BR, 2.5 BA, 1700+ SF home is better than new! Bedroom & full bath downstairs. Upgraded floors & custom paint throughout. Fantastic location in Mountain’s Edge! Custom closet in the master & much more! Gorgeous 3 BR, 2 BA, 2100+ SF 1-story has been remodeled throughout with granite counters, upgraded appliances, custom paint, wood floors & more. Huge backyard paradise with refinished pool & RV parking! *Programs can change without notice. At close of escrow, restrictions apply. Call for details. **Restrictions apply. Call for details. MORE BEAUTIFUL HOMES COMING SOON! Lovely 1-Story in Beautiful 55+ Gated Community. This Home is a Bargain & Priced to Sell! $2,000 Credit to Buyers Closing Costs! CALL DEBRA TODAY TO VIEW THIS HOME! Please Say You Saw It In HOMES ILLUSTRATED! TURN-KEY 1-STORY ON 1/4 ACRE IN SILVERSTONE RANCH! Spacious 3 BR, Over 2100 SF Single-Story Home with Huge Backyard that Faces South & Tandem 3-Car Garage! Modern Open Concept Pulte Home with 2x6 Framing & Energy Efficient Construction. Separate & Spacious Master Suite with Large Soaking Tub in En Suite Bath. Plush Carpet, Ceramic Tile Floors, Corian & Counters & More! dale@plankrealestate.com Please Say You Saw It In HOMES ILLUSTRATED! Lennar Opens Refreshed Model Homes at Regatta Heights in Lake Las Vegas Lennar Las Vegas has renovated and re-opened two new model homes at its Regatta Heights community in Lake Las Vegas. Regatta Heights is a gated single-story community in the heart of the 3,600-acre masterplan community of Lake Las Vegas. Home shoppers are invited to stop by and see the 2,552-squarefoot Oxford and the 2,710-square-foot Hampton models. The Oxford features three bedrooms and three and a half baths along with a three-car garage. It boasts an open floorplan with a layout ideal for indoor-outdoor living. The kitchen is equipped with a large island, granite countertops, 42-inch cabinets with crown molding and a GE Profile™ stainless steel appliance package with a double oven and refrigerator. The Oxford is priced from the mid $400s. The Hampton offers four bedrooms, three and a half baths and a two-car garage. It features the same extensive kitchen package as the Oxford plus a fourth bedroom with a walk-in closet and its own bathroom. The fourth bedroom boasts the option to add a door for outside access. The Hampton is also priced from the mid $400s. fine dining, Reflection Bay Golf Club and a 320-acre lake that offers water sports such as kayaking and rowing.” “Plus, Regatta Heights is well-known for offering incredible value with homes under $500,000,” she added. A limited supply of the 82 home sites remain, and all are equipped with tankless water heaters and low-e vinyl windows. Residents of the 3,600-acre masterplan community of Lake Las Vegas enjoy a 320-acre lake, two award-winning golf courses, a new sports club and water sports activities. Complete with fine dining and grocery shopping available at The Village, Lake Las Vegas is a short drive from the Las Vegas Strip and downtown. For more information on Regatta Heights at Lake Las Vegas call 702-821-4850 or visit the sales office at 7 Via Clemente. The sales office is open Monday through Thursday from 9:30 a.m. to 5 p.m.; Friday from noon to 5 p.m. and Saturday and Sunday from 9:30 a.m. to 5 p.m. For information on all new home collections in Lake Las Vegas, visit www.lakelasvegas.com/new-homes. 5% MANAGEMENT FEES OR $100 (WHICHEVER IS GREATER) IF I LEASE YOUR HOME, LEASING FEE IS WAIVED! PROVIDE & ➠ IWILL HANDLE… ➠ YOU WILL GET… TENANT SCREENING, REPAIRS AND MAINTENANCE, ALL HOA MATTERS & MUCH MORE! FULL ACCOUNTING, MONTHLY AND ANNUAL STATEMENTS, DIRECT DEPOSIT. Beautiful & Spacious 5 BR, 3 BA, 3073 SF 2-Story Home Located on a Cul-De-Sac! High Vaulted Ceilings. Spacious Kitchen with Center Island. All Appliances Included! Hardwood & Carpet Flooring Throughout. Large Family Room with Fireplace. Bedroom & Bath Downstairs, 3-Car Garage + So Much More! PRICED TO SELL! NO HOA! CLOSE TO AIRPORT! Fantastic 4 BR, 3 BA, 1900+ SF 1-Story Home on Corner Lot! Open Floorplan with Oversized Bedrooms. Master Suite with Private Bath with Marble Walls & Seat in Shower. Large Living Room with Fireplace, Dining Room & Large Attached Family Room. Hardwood & Tile Floors. Private Backyard with Fruit Trees & More! REDUCED! ONLY $245,000! Homes l Condos l Townhomes l Vacant Land l Rentals Please Say You Saw It In HOMES ILLUSTRATED! Purchasing a home can be one of the largest investments you will ever make in your life. With 20 years experience, we enjoy helping first time home buyers and even seasoned mortgage applicants in getting the perfect home loans for their scenario. Whether purchasing or refinancing, we will walk you through this exciting process. International City Mortgage, Inc., DBA Doorway Home Loans is an Equal Housing Lender. NMLS #1590259. All programs, terms, rates and conditions are subject to change without notice. Business services and products do not originate from HUD, FHA, the Government of the United States, or any Federal, State or local government agency. California Department of Business Oversight Residential Mortgage Lending Act License #4130570. Nevada Mortgage Banker License #3795. HOME & RENTERS INSURANCE Get your free quote today! PERFECT FOR ENTERTAINING… Spectacular Ranch Style 4 BR, Almost 3700 SF Home in All Single-Story Community! Amazing Open Island Kitchen – Dining Bar, Nook, Walk-In Pantry, Double Ovens & More. Huge Great Room + Study/Den. Refreshing Beach Entry Pool in Backyard with Extended Covered Patio, Built-In BBQ/ Bar – All This on .28 Acre Corner Lot! Priced at $580,850. UPDATED POOL HOME ON .22 ACRES… All NEW Interior & Exterior Paint + NEW Flooring in this 3 BR, Over 2700 SF 1-Story in The Lakes. Fully Remodeled Bathrooms & Chef’s Kitchen with Prep Island, Viking Commercial Range, SS Appliances + More. Very Private Backyard with Pool/Spa, Built-In BBQ, Extended Covered Patio. RV Parking. Close to Everything. Priced Under $550,000. HIGHLY SOUGHT AFTER 1-STORY TOWNHOME… Golf Course Frontage Views from this 2 BR, Almost 2000 SF Townhome in Spanish Trails. Highly Updated/Upgraded Kitchen – Island Nook, Custom Cabinets, Viking Appliances & Granite Counters. Oversized Master Suite with Updated Bath. Private Patio with Built-In BBQ. Fantastic Community Amenities! Priced at $459,900. TURN KEY WITH STRIP VIEWS… Highly Sought 1 BR, Over 900 SF High Rise Condo at Panorama Towers with Direct Strip Views From Every Room! Study/Den & Balcony. Granite Counters, SS Appliances & Breakfast Bar in Kitchen. Amenities Include Pool/Cabanas, Fitness & Business Centers, Guard Gated, Concierge Services. Close to T-Mobile Arena & New Raider’s Stadium Priced at $395,000. OVER 1800 SF FOR UNDER $300K… Check Out This 3 BR 2-Story with Open & Bright Kitchen. No Carpet Downstairs. Master Downstairs with Walk-In Closet, En Suite Bath – Dual Vanity, Separate Shower & Tub. Brand New Stainless Sink & Faucet. Huge Loft with Striking Mountain Views! Big Secondary BRs with Walk-In Closets & Ceiling Fans. Priced at $297,000. READY FOR YOU TO CALL THIS HOME… 3 BR, Almost 1800 SF 2-Story. Spacious Floorplan Downstairs. Great Room & Dining Area. Open Kitchen – Big Walk-In Pantry, Breakfast Bar & Tile Counters. Spacious BRs – 2 with Walk-In Closets. Separate Laundry Room. Corner Lot with Lots of Privacy. Easy Maintenance Landscaping. Gated Community Close to Everything! Priced at $299,000. Stunning estate home located on just under 1/2 acre in a gated community. Almost 4400 SF of breathtaking living space. Sunken formal living room. Spacious great room with built-in bookcase. Master suite upstairs with custom closet walk-in closet & balcony. Other 3 BRs are downstairs – all with walk-in closets. Entertainer’s dream backyard with sparkling pool & spa + lots of room to play, relax & entertain family and friends. Don’t miss out. Priced at $795,000. CALL RON RUTHE TODAY TO TOUR THIS HOME! (702) 493-6400 Please Say You Saw It In HOMES ILLUSTRATED! BEAUTIFUL HOMES ON ACREAGE – OWN ONE TODAY! BREATHTAKING CUSTOM HOME! • 4 BRs + Den • 3 BAs • 3690+ SF • 3-Car + RV Parking Gorgeous Doesn’t Even Begin to Describe This Unique Single-Story Custom Home on 2.5 Acres with Well & Septic. Awesome Mountain Views from Large Pella Windows. Dream Island Kitchen with Top Grade SS Appliances, 5 Gas Burner Stove, Double Ovens & More. Spacious Master Suite with Huge Walk-In Closet & Bonus Room. Full RV Hookup & Lots of Trees. $568,000. BEAUTIFUL HOME ON 1 ACRE! • 3 BRs + Den • 2 BAs • 1800+ SF • 2-Car • Horses Permitted Charming Home on a Quiet Paved Road with Awesome Views of Shadow Mountains. Private Well & Septic. All Fenced & Fully Landscaped with Raised Gardens & Horse Area All Lined with Pine Trees. Home Featured Remodeled Kitchen with Large Pantry. Separate Family Room. 24’x22’ 2-Car Garage, 12’x6’ Shed & 11’x12’ Lean to Shed. Priced to Sell Fast. $210,000. Call Me Today For A FREE Home Valuation! No Brokerage Transaction Fees! r Of Ou ts e n O Call ced Agen rien Expe Today! Gorgeous renovated unit. New laminate flooring & newer carpet. Custom 2-tone paint. Granite kitchen. All appliances included. Ceiling fans. Spacious living & dining areas. Split BRs. Master suite with large walk-in closet, extended vanity, garden tub & separate walk-in shower. Nice sized guest BR. Balcony has gorgeous mountain views. Furniture in unit can be included or removed. COMMUNITY POOL, GYM, CLUBHOUSE, BBQ AREAS & LUSH GROUNDS! Community pool, spa & clubhouse with social calendar. New custom 2-tone paint. New laminate floors in traffic areas & new carpet in BRs. Gas fireplace. Granite kitchen with stainless appliances. New beds/bedroom furniture, linens, electronics. Cov’d patio. HOA allows 2 pets weighing no more than 35 lbs. each. Minimum 31 day lease. EZ ACCESS TO STRIP, RETAIL & RESTAURANTS! 2 BR/2 BA – RENOVATED DOWNSTAIRS CORNER CONDO Partially furnished with living room & dining room furniture. Neutral paint. Newer carpet. Tile in traffic areas. Stainless kitchen appliances. Spacious dining & living areas. Separate master suite with fan. Nice sized guest BR. Washer & dryer included. Patio with nice views of common areas. Convenient location. GATED COMMUNITY WITH INDOOR & OUTDOOR POOLS, GYM, PICNIC & BBQ AREAS! Courtyard entry. Very spacious floorplan. Formal living/dining room. Separate family room with fireplace. Island kitchen. All appliances included. Downstairs den. Upstairs bonus/theatre room w/theatre seating included. Private backyard with built-in BBQ & firepit. MASTER SUITE WITH 2-WAY FIREPLACE & SITTING ROOM! Community pool, spa, workout center, clubhouse & tennis courts. All appliances, furniture, dishware & linens included! Spacious living/dining areas. Separate master suite with 2 mirrored closets & walk-in shower. Nice sized balcony. GREAT LOCATION WITH EZ ACCESS TO 215, RETAIL & RESTAURANTS! Well-maintained Silverado Ranch home. Custom 2-tone paint. Upgraded lighting, fans & fixtures. Island kitchen with granite counters & stainless appliances. All appliances included. Formal living & dining rooms. Spacious master suite with walk-in closet. SEPARATE FAMILY ROOM + DOWNSTAIRS BEDROOM & BATH! ATTENTION: INVESTORS / HOMEOWNERS LUXE International Realty & Property Management Offers Full Service Property Management Below are some of the services we offer to our clients: • Placement of well-qualified tenants, using strict qualification criteria, to avoid costly headaches of non-payment, eviction & high maintenance/turn-over costs. • Extensive marketing, at our cost, to get you the most exposure/best applicants/top dollar for your home. • Use of clear, easy-to-understand financial statements – monthly & at tax time. • Use of cutting edge technology to track expenses, repair history, warranties, etc. • No monthly charges are assessed to the homeowner/investor during times of non-occupancy. • Agents available 7 days/week to respond to rental inquiries & to show rental properties. • 24-hour emergency repair/contact line is provided to tenants. CALL US TODAY TO DISCUSS HOW WE CAN IMPROVE YOUR RENTAL PORTFOLIO Please Say You Saw It In HOMES ILLUSTRATED! o t e m i t d o o g a Is it ye r u b e m i t t s r fi a be in Las Vegas? If first-time homebuyers seem confused these days, it would be hard to blame them. After all, just a few weeks ago, we saw two seemingly conflicting national reports about whether or not Southern Nevada is a good place for first-time homebuyers. First, BankRate.com issued a report ranking the Las Vegas market as the 8th worst metro area in the country for first-time buyers. See the report at https://www.bankrate.com/mortgages/bestcities-for-fist-time-homebuyers/. BankRate.com based its low ranking for our area on 13 measures related to affordability, culture, the job market, market tightness and safety. It used what it described as “the most recently available data for the 50 most populous metropolitan statistical areas, or MSAs. For our analysis, we gave affordability a 30 percent weighting, safety, market tightness and the quality of the job market each a 20 percent rating, and culture a 10 percent rating.” Just one day after BankRate.com released its report, Zillow issued a March 19 report and news release on a similar topic that painted a completely different picture of the situation in Southern Nevada for first-time buyers. On its list of the “Ten Best Markets for FirstTime Homebuyers” available at https://www.zillow.com/research/ best-metros-for-first-time-buyers-23368/, Zillow ranked Las Vegas as the second best place in the entire nation for such buyers. Zillow used different criteria for its lofty ranking for the Las Vegas area, including these four metrics: • Low median home value that requires a smaller down payment. • Strong forecasted home value appreciation, helping buyers’ overall wealth grow. • High inventory-to-household ratio, to indicate available supply. • High share of listings with a price cut. Talk about mixed messages. When a local journalistic contacted the Greater Association of REALTORS® and asked me about this issue, I explained that the answer to the question depends on who ask – and when. I don’t want to get into the weeds here in comparing the methodology that led these two different companies to come up with two completely different conclusions about the state of our local housing market for first-time buyers. But I can tell you this: I believe our local housing market is certainly more favorable today for first-time buyers than it was just one year ago. Consider that our most recent GLVAR statistics show that the median price of an existing home sold here in Southern Nevada during February was $296,200. That was down from an even $300,000 in January, but still up 7.7 percent from $275,000 in February of 2018. At the same time, our local housing supply has been rising rapidly in recent months, with nearly a four-month supply of homes available for sale. One year ago, local home prices were rising more rapidly – posting a year-over-year gain of 14.6 percent through February of 2018. Meanwhile, our local housing inventory one year ago had shrunk to less than a two-month supply of available homes. That was a tough time for almost anyone looking to buy a home, especially for first-time and entry-level buyers. No matter who’s housing report you’re reading these days, if you’re looking to buy your first home in Las Vegas today, you’re odds have certainly improved. Please Say You Saw It In HOMES ILLUSTRATED! Please Say You Saw It in HOMES ILLUSTRATED! Give Us a Call or Visit Our Website to Get Started TODAY! GREAT LOCATION! Close to Both Elementary & High Schools. Quick & Easy Access to Shopping & Highway. Home Features Include: Granite Counters, Tile Floors Throughout, Ceiling Fans, Spacious Laundry Room, Fully Finished 2-Car Garage & Much More. This Upgraded Custom Home is on 1/4 Acre! TOO MANY UPGRADES TO LIST! Spacious 5 BR, 3.5 BA Home. 1.25 Acres with 3-Car Garage & Beautiful, Unobstructed Views of Mt. Charleston. Great Location in a Newer Neighborhood. Quick, Easy Access to Highway, Schools, Shopping & More. Hurry, This Home Will Sell Fast! 3300 Underbrush Ave., Pahrump, NV 89048 Please Say You Saw It in HOMES ILLUSTRATED! home and finance it ALL in ONE package! STOP! D TURN TH ON’T E PAGE! Multi-wide manufactured housing, 1 unit, single-family custom. Finance the construction, lot purchase and permanent mortgage with a single loan. Why worry about re-qualifying or incurring additional costs? Designed for manufactured, modular, and stick-built housing, this program offers all-in-one financing option for construction, lot purchase, and permanent mortgage funding with one closing. Because the permanent loan is closed before construction begins, there is no need to re-qualify the borrower, simplifying the construction and purchase process. © 2019 JFK Financial Inc. 8985 S. Eastern Ave., Suite 325, Las Vegas, NV 89123 Phone 702.895.7177 NMLS #6540. Trade/service marks are the property of JFK Financial Inc. This is not a commitment to lend. Restrictions apply. All rights reserved. Some products may not be available in all states. JFK Financial Inc. is not acting on behalf of or at the direction of HUD/FHA or the federal government. NMLS consumer access: www.nmlsconsumeracces.org/EntityDetails.aspx/COMPANY/3233. *Programs subject to change without notice. Please call for details. Ask Us About Our Tax Return Specials! * No Transaction Fees! Home Inspections Paid! Appraisal Fees Paid! Home Warranties Included! BEAUTIFUL REMODEL ON ALMOST 1 ACRE! VACATIONERS DREAM IN MT. CHARLESTON! Fabulous updated finishes throughout this 3 BR, 2100+ SF home. Mountain retreat with incredible views! Large wrap around patio over 3 fireplaces add to the warmth & romantic ambiance to the master the mountainside. Southwestern appeal in this 3 BR, 2 BA home with large wood burning fireplace in family room! Detached 2-car garage. suite & living spaces. Hurry! This is a rare find in Pahrump! MOVE-IN READY! DESERT SHORES BEAUTY! JUST LISTED – ALMOST 1/2 ACRE! The backyard is like a tropical oasis with waterfall into the pool & has Gorgeous 3 BR + den, over 2000 SF 2-story on a corner lot. Spacious fenced off area for dog run or children’s play area. 5 BRs + den, 3 full with vaulted ceilings, new carpet, fresh paint and a private backyard. A fabulous community that is nestled on the water! BAs with amazing finishes throughout! COMING SOON – ALMOST 1/4 ACRE! JUST LISTED – ENTERTAINER’S DREAM HOME! Huge backyard with pool and slide awaiting your next BBQ. Tri-level Fully remodeled manufactured home on a huge loft with 4 BRs, floorplan is perfect for private/quiet time with 4 BRs. The converted spacious family room, large covered patio, sparkling pool & so much garage is usable as an apartment with kitchenette and bathroom. more! Easy access to shopping, restaurants, school, etc. Some homes may have sold or list prices may have changed by the time this ad is published. Please call to verify current listing information. *Certain restrictions apply. Call Us Today For Your Free List of Upcoming Move In Ready Homes Before They Show Up Here! Please Say You Saw It in HOMES ILLUSTRATED! Offering Courses in: • Real Estate • Mortgage Lending • Inspection • Appraisal • Property Management • Association Management • Business Sales • And All Other Fields Related to Real Estate CALL TODAY! *This promotion cannot be combined with any other promotion. Additional restrictions and terms may apply, see school for additional details. Are You Looking To Buy or Sell A Home? Choose Our Mom, She’s a Doggone Good REALTOR®! Looking for a Property Manager? Patty Can Help! I Make Property Management Easy for Landlords! O. Bright & sunny floorplan with spacious rooms. Breakfast nook in the open island kitchen. You can relax in the serene & quiet backyard to enjoy your morning coffee. Formal living & dining rooms. Separate family room. Gas fireplace. Large, upstairs master suite with 5 piece bath. Very Pet Friendly Management – Call Today! The Home Shop is a full-service Real Estate brokerage which is able to assist you with all your real estate needs. 3 BRs, 2.75 BAs, 2-Car, 1476 Sq. Ft.
Immaculate Monticello with Golf Course, City and Mountain Views! Golf course, city and mountain views! Immaculate Monticello with large owner’s suite and 2 secondary suites. Family room with fireplace, and formal living and dining room. Kitchen has island, built-in oven, and microwave, and skylights. Master suite has large walk-in closet, double sinks and separate tub and shower. Laundry room with sink and cabinets. 3-car garage has storage shelves, cabinets and sink. Backyard with large patio. Beautiful views day or night! Must see! Age-restricted, 55+. ELEGANT HOME TUCKED AWAY IN SUMMERLIN…In the guard gated community of Corta Bella, this 3500+ SF home offers a paradise backyard with pool perfect for relaxing and entertaining! Formal living and dining. Downstairs den. Kitchen with stainless appliances, granite counters, island with breakfast bar + eating nook. Family room with fireplace. Large master suite with built-in entertainment center and remodeled master bath. 2 additional BRs upstairs with family room. This is the home you’ve been looking for. BEAUTIFUL SUN CITY SUMMERLIN…Popular Tahoe floorplan with an added 162 SF den/media room. Open floorplan features 2 BRs + den/office, 1695 SF of fabulous living space. New carpet and fresh paint throughout! Enjoy spending evenings on your patio watching sunsets over the mountains. Community includes three 18 hole golf courses, 3 restaurants + 4 rec facilities with more than 80 resident organized social and rec clubs covering a wide variety of interests for all to enjoy! You’ll love this house. REMODELED Single-Story! 5 BR, 3 BA on Almost 1/2 Acre with RV Parking! GORGEOUS 2-Story! 3 BR, 3 BA, Over 1500 SF in Henderson! BEAUTIFUL 2-Story! 3 BR, 3 BA Like-New Home in Inspirada! Call Us, Mention This Ad & We’ll Pay for Your Appraisal! Call Shayna For ALL Your Lending Needs! Shayna Laurel, Loan Officer - NMLS #404765 Direct: 702-660-2362 / Cell: 805-610-2797 *Programs subject to change without notice. Call for details. SELLING OR BUYING A HOME? Lilly is The RIGHT Choice! Lilly Ruiz, REALTOR® Always Focused on YOUR Real Estate Needs, Communication From Start To Finish! Delivering RESULTS! FREE BUYER REPRESENTATION! Schedule Your Appointment Today! THANK YOU VETERANS! I am a USMC Wife & Military Friendly Agent who Loves working with our Military both Active & Retired! GORGEOUS CUSTOM BUILT HOME Built in 2005 with over 3300 SF + a 1239 SF Workshop sitting on Over 1/2 Acre. 4 BRs, 4 BAs, RV Parking with Electric & Dumping Station. Top of the Line Stainless Steel Appliances, Huge Rooms, Water Softener, R/O, Intercom & More! ABSOLUTELY STUNNING HOME 4 BRs, 3 BAs, 2390+ SF 2-Story. Beautiful Granite Island in Kitchen with Granite Counters & Stainless Steel Appliances. Brand New Floors. Finished Backyard with Synthetic Grass & Pavers. Built in 2015. This is Truly a Must See! If You’ve Been Thinking About Moving Up, Downsizing or Changing Locations, I’d Like to Help with Your Real Estate Needs. Absolute pride in ownership in this 2 BR, 2 BA, 1000+ SF 1-story home. Wonderful, inviting entry. Open floorplan. Great kitchen with SS appliances! Separate laundry room. Water softener, oversized patio & lush landscape. 2-car garage & more. No HOA!!! This is priced to sell! Spacious 4 BR + loft, 2.5 BA, almost 2100 SF home with a bright & spacious floorplan. Fabulous island kitchen with lots of cabinets & counter space. Inviting living/dining room. Separate family room. Master includes walk-in closet & huge bath. Beautiful backyard with covered patio! One look & you’ll know this is your home! 4 BR + loft, 3.5 BA, 2000+ SF with a split floorplan. Private bedroom & full bath on lower level. Bright & spacious mid-level area with living & dining + a den. Gourmet kitchen with granite counters & oak cabinets. Amenities & more! Assisting Residential Buyers and Sellers to meet their goals in current market conditions. Top Dollar for Probate Residential Real Estate Liquidation. I am “your real estate consultant for life”. Stunning 4 BR + loft, 3.5 BA, 4100+ SF home. Upgraded island kitchen with walk-in pantry, granite counters, tile floors, nook & more. All BRs have walk-in closets & ceiling fans. Bedroom & full bath downstairs! Backyard features a pool, oversized spa, firepit in a park setting. Full size batting cage with lights. Community offers 3 parks & easy access to trails! Spacious 4 BR, 3.5 BA, over 2750 SF 3-story home. Great room with gorgeous electric fireplace. Kitchen features huge hexagon marble countertop & pantry. 3rd level features spacious master suite & large family room with balcony! 24’x56’ mobile home – totally renovated! 3 BR, 2 BA with huge living room/dining area. Separate laundry room. Large master suite. Full length covered deck in front of home & small covered deck in back. New paint, new laminate wood plank floors & more! The most recognizable real estate magazine in Las Vegas. For over 50 years, LAS VEGAS HOMES ILLUSTRATED has been connecting Real Estate Professionals with Buyers and Sellers. • Nellis Air Force Base • Real Estate Offices • Mortgage Offices • Direct mailed out of state! Homes Illustrated has you covered IN PRINT & ON LINE! Your listings will be visible to millions of people through our website which syndicates to over 30 Real Estate Websites including Trulia, Zillow, Yahoo! Real Estate, USA Home Search, Wall Street Journal and more! Almost 1600 SF townhome with 2 BRs, 2 BAs & attached 1-car garage. All kitchen appliances including microwave stay! Gated community with BBQ area, pool, spa, jogging park, pet park & security. Close to everything! SPACIOUS 2-STORY IN THE NORTH! Open & inviting living room in this 4 BR, 2.5 BA, 2100+ SF home. Separate family room opens to the island kitchen. Dining/kitchen area is spacious! Washer & dryer included. Large master suite & more! RARE FIND IN THE NORTHWEST! Lovely 3 BR, 2 BA, 1700+ SF single-story home that shows true pride of ownership! Located in a small, quiet gated community with low HOA, big pools, spas, large clubhouse & more. Well maintained with private yard. COZY 1-STORY IN GREEN VALLEY! Freshly painted interior & exterior! Tile floors throughout this 3 BR, 2 BA, 1400+ SF home. All appliances included. Built-in bookshelves in living room. Located near 215 freeway, shopping, Arroyo Grande Sports Complex & more! www.PRALV.com Please Say You Saw It in HOMES ILLUSTRATED! GV RANCH - GORGEOUS ONE STORY, 3 BEDROOM! SOUTHERN HIGHLANDS - BIG 4 BEDROOM! 3 BR, 2 BA single-story home in Green Valley Ranch! Upgrades throughout Large, open floorplan with 4 BRs, 2.5 BAs in Southern Highlands. All new flooring including tile floors, granite counters and stainless appliances included. Vaulted and paint throughout. Open kitchen with granite counters and breakfast bar. ceiling, open floorplan, 2-car garage. All appliances, 2-car garage, over 2500 SF. .
UPGRADED 4 BEDROOM IN GATED SEVEN HILLS! CENTRALLY LOCATED - LARGE 4 BEDROOM HOME! Newly upgraded 4 BR, 2.5 BA attached home in gated Seven Hills community. 4 BR, 3 BA home on a huge lot! Separate living/family/dining rooms, fireplace, Master bedroom down, 3 BRs + loft upstairs. All new paint, flooring and granite. balcony, huge yard with covered patio. All granite countertops and fresh paint throughout. 2-car garage, 1970 SF. All appliances included, 2-car garage + backyard. 2 BEDROOM GATED CONDO - GREEN VALLEY! I am Your REALTOR®, Going Beyond Your Expectations! STUNNING HOME IN GUARD GATED RANCHO BEL AIR WITH PRIDE OF OWNERSHIP INSIDE & OUT! Beautiful custom 4 BR + office, 4300+ SF 2-story home. Several high-end custom decorator items. Fireplace with antique wood mantle & hearth, huge barn door, new front doors, wet bar with built-in wine storage. 600 SF Florida room. Backyard oasis with park-like landscape, heated pool/ spa, built-in gas BBQ, custom café lighting & more! Call for current price. SUMMERLIN BEAUTY WITH AMAZING STRIP VIEWS! Contemporary open floorplan in this 3 BR + den & loft, 2500+ SF home. Floating staircase. Stunning, large walk-in master shower with glass. Beautiful kitchen with SS appliances. Epoxy floors in garage & so much more! Call for current price. MOVE-IN READY SINGLE-STORY IN GREEN VALLEY! Open floorplan in this 2 BR + den, 1600+ SF Alabaster model in Sun City MacDonald Ranch. Located on a fully fenced elevated lot. Black SS appliances included in the granite island kitchen! Great amenities in this 55+ community. Call for current price. LIKE-NEW & UPGRADED 2-STORY IN THE NORTHWEST! 3 BR + loft, 1700+ SF home. Tile floors down & Mohawk engineered hardwood floors upstairs. Large island granite kitchen has custom cabinets & breakfast bar. Large master with dual marble sinks, glass surround shower & large garden-style tub. Call for current price. Jayne Has Been Helping Buyers and Sellers Since 1979 Let My Knowledge & Expertise Work For You, I Am with You Every Step of the Way. Selling Las Vegas For Over 37 Years… Experience = RESULTS! FABULOUS SOUTHWEST NEIGHBORHOOD! Home Is Possible Program Available – Call for Details! Priced Under $295,000 Very popular, open & spacious 3 BR, 2 BA, almost 1600 SF single-story home. Located in a great neighborhood off of Buffalo & Hacienda. Large living room, formal dining room & separate family room. Open & spacious kitchen with breakfast area overlooks the family room. Separate master suite with master bath that has a walk-in spa tub. Vaulted ceilings & plant shelves galore! Large yard & 2-car garage. Just listed, call for your private tour! LOOKING FOR PRIVATE MONEY? CALL JAYNE AT (702) 227-9020 MODEL QUALITY 2-STORY HOME IN GREEEN VALLEY! The One You’ve Been Looking For! Priced Under $464,000 This beautiful home features almost 2800 SF with 3 huge BRs (4th BR possible), 2.5 BAs, & a spacious loft upstairs. Master suite with luxury bath & big walk-in closet. Great room + separate living room. Formal dining room. Open eat-in kitchen with large island, beautiful granite counters – full backsplash behind cooktop & loads of cabinets. Professionally landscaped backyard ready for Summer fun! Beautiful use of real wood floors & ceramic tile. Tandem 2-car garage. Located near highly requested schools. Gated community with beautiful parks & playgrounds. Call for your private tour & make this one yours! Owner is the architect on this 3 BR + den, approx. 3100 SF home. Being sold fully furnished! Floor to ceiling glass doors from great room overlooks the pool/spa. Master downstairs with jetted tub in bath. In Section 10 on almost 1/2 acre! 1-STORY BRICK HOUSE ON CORNER LOT! MCNEIL ESTATES HOME ON LARGE LOT! 4 BR, 3 BA, 3700+ SF home on little over 1/2 acre in Section 11. Separate living & family rooms. Large eat-in kitchen with SS appliances. Huge master with ﬁreplace, his & her closets. Corner lot with RV gate, pool/spa in huge backyard with mature landscape, fruit trees, storage/workshop & more! Spacious 4 BR + den, 2.5 BA, 2700+ SF home on almost 1/4 acre! Large living room with gas ﬁreplace, redwood ceiling, wet bar & separate guest bath. Large eat-in kitchen. All appliances stay! Covered patio with built-in BBQ, pool with slide & solar heat. Will go fast! 5 BEDROOM HOME IN ALIANTE! 5 BR, 2.5 BA, almost 2800 SF Astoria built home. Wood & tile ﬂoors downstairs, sunken living room, formal dining room & separate family room. Granite Island Kitchen with breakfast bar. Master with retreat & en suite bath. Solar head pool with waterfall, covered patio & more! Own your own fruit orchard on over 2 acres in Logandale with approx. 800 SF apartment + large trailer on property that stays! Grape vines connected to bridge over river rocks, large ﬁrepit & BBQ & so much more! Possible commercial zoning. THINKING OF SELLING? YOUR HOUSE COULD BE FEATURED HERE! SELLING THE LAS VEGAS VALLEY FOR 25 YEARS! ABLE L I A V A NOW! Cozy 3 BR, 2 BA, 1000+ SF single-story townhome in Spring Valley. 1-car garage + covered carport. Located on a good size lot with private backyard. No HOA! Convenient location close to schools, shopping, freeways & more. This is priced to move fast, don’t wait! Turn-key single-story home on a nice size fully landscaped lot. Just over 1200 SF with 2 BRs & a den. Kitchen features nice oak cabinets & granite counters. Family room is wired for surround sound + it has a great TV niche & fireplace. Den opens to family room & can easily be closed off. Master bath has large double sink vanity, garden tub & separate water closet. This home is ready to be yours! 5 Acres ready for you to build your vacation getaway! Located just outside of Ely, this property brings the great outdoors to your doorstep. Fishing, hiking – all the fun outdoor adventures await! POWER is at the lot. You can get started right away! This land is priced to sell fast! Hurry before you miss out! WHETHER BUYING OR SELLING, I CAN MAKE IT HAPPEN!! 100% COMMITTED TO CUSTOMER SERVICE FOR MY CLIENTS!! Please Say You Saw It in HOMES ILLUSTRATED! Extraordinary 2 BR, 2800+ SF High Rise Condo with Beautiful Views, Tons of Upgrades & Fantastic Amenities! Developers Wanted! 5 Subdivided 3/4 Acre Lots. Zoned RS-1 Packaged as One Sale. Horse Property Zoned RS-1. 4 BR, Almost 2700 SF Home with Huge Island Kitchen, Tile Floors Downstairs, All Appliances Included & More! Investor Special on This 2 BR, 1600 SF Home with Den That Could Be 3rd BR, Granite, Vaulted Ceilings & More! 2 BR, Almost 1300 SF Mid-Rise Condo Minutes from the Strip, New Raiders Stadium. Great Community Amenitites! 3 BR, 1200+ SF Downstairs Condo with Cozy Fireplace, Good Sized Kitchen with Plenty of Cabinets & Appliances! Looking for a Rental Home? NO CHARGE TO YOU! 3 BR, Almost 1900 SF Home in Summerlin 5 BR, 2200+ SF Remodeled 2-Story with with SS Appliances, Ceiling Fans in All 2-Way Fireplace between Living & Dining Areas, New Carpet, Paint & Ceiling Fans! BRs & Family Room & All Appliances! Tropicana & Pecos 2 BR, 1800+ SF Remodeled Townhome in Paradise Springs with Brand New Kitchen, Fireplace in Master & More! 3 BR, 1200+ SF 1-Story on 3 BR, Almost 1200 SF 1st Floor 3 BR, 2200+ SF Townhome with Condo with Fireplace, Granite Almost 1/4 Acre Corner Lot 2-Car Garage, Separate Family Room, Living Room with Fire- with Neutral Paint, Hardwood Counters in Kitchen & Baths, Patio Access From Master! Floors, All Appliances & More! place & All Appliances! Please Say You Saw It In HOMES ILLUSTRATED! Fully Furnished 2 BR + Den, 2200+ SF Home Remodeled 4 BR + Loft, 3000+ SF Home with Finished Basement, Fireplaces in Living with Master Downstairs, New Paint, Floors, & Family Rooms & Amazing Views! Light Fixtures & Appliances, Pets OK! 2 BR, Almost 900 SF Condo with Breakfast Bar in Kitchen, Spacious Living Area & Pets Welcome! BUYER’S MARKET! BUYER’S MARKET! BUYER’S MARKET! Call now to start looking for your dream home! We have GREAT LOAN PROGRAMS and DOWN PAYMENT ASSISTANCE PROGRAMS that can help you with the down payment - AND - the seller can help you with the closing costs. WITH VERY LITTLE MONEY OUT OF YOUR POCKET! Selling Real Estate for 17 years and still LOVE my job! Beautiful Cul-De-Sac Home with a HUGE Backyard for Your Enjoyment! Sell Your Home With Me For 4.5% Commission! Full Service Listing with No Gimmicks or Hidden Fees. • Professional Photos • Seller Home Warranty • Open House • Facebook Advertising • All Internet Sites • Plus much more! I will negotiate your transaction from beginning to close of escrow… Call me for a FREE and ACCURATE Evaluation of your Home Value! 1,000,000 SQ. FT. OF COMMERCIAL MANAGED – 3% MONTHLY FEE!